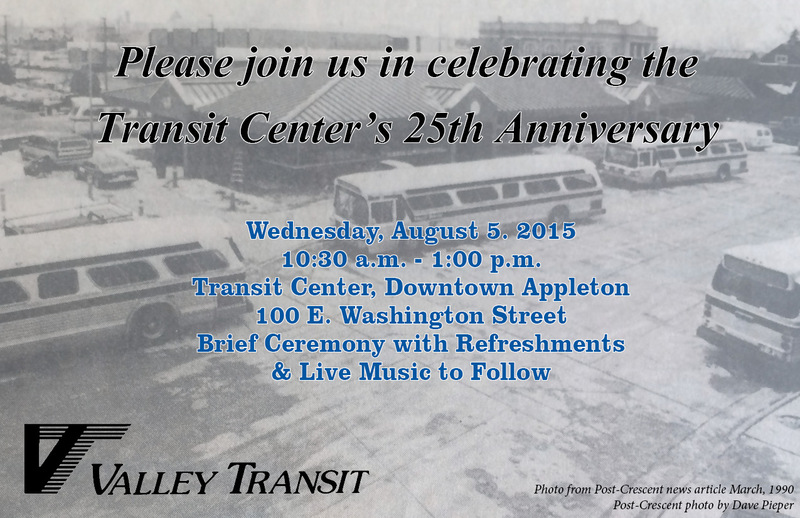 Valley Transit is celebrating the Downtown Appleton Transit Center’s 25th Anniversary on Wednesday, August 5th from 10:30 a.m. to 1:00 p.m. A brief ceremony with Mayor Hanna and Fox Cities Transit Commission Chairman, Chuck Rundquist, will be followed by refreshments, family activities and live music. To commemorate 25 years of transit service, a new mural, located inside the transit center, will be officially revealed – as will the two winning drawings submitted to Valley Transit’s kids’ coloring contest. The drawings, which were responses to the prompt “What Does the Valley Transit System Mean to You” will be featured on the side of a bus for one month. The 25th Anniversary of the Transit Center marks an important milestone for Valley Transit and its service to the community. The Transit Center has given riders a safe and comfortable place to catch their bus, making public transportation more welcoming and convenient. It continues to be a place in which riders can feel a sense of community while waiting for their connecting bus. Valley Transit provides safe and reliable community transportation throughout the Fox Cities in northeast Wisconsin. Services provided include fixed-route bus service, Valley Transit II ADA paratransit, The Connector, Call-A-Ride and six additional specialized and rural transportation services to seniors and people with disabilities.